It's that time to start looking forward to the next year's expansions and charters. I'll start off this year thanking everyone for their information. I can't do this on my own. I greatly appreciation the help and kind words. 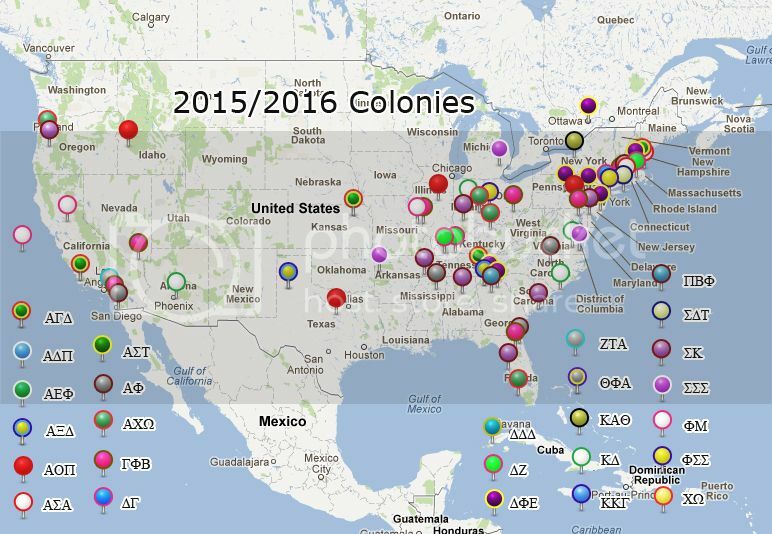 -In the colony sections, I list the colonies that are for this school year (Fall '15-Spring '16). However, since IFC colonies often take 1-3 years before chartering, I will mark a colony from a previous year with an '*'. -Stacked colonizations will be noted in the "Open for Expansion" section. If a group is supposed to colonize in Fall'16 or later, they will go in a later thread. -As I've said in the past, I try to keep this list as accurate as possible. If I feel that a source is not reliable (not person, source), I will hold off until I can get another source to verify. So please don't be upset if I don't automatically put your posting that the Eleanor Roosevelt Memorial College is adding 15 organizations. I will. -If you see something misspelled or the wrong school/organization listed, please post the correction or send me a pm. Last edited by LaneSig; 08-10-2015 at 02:01 PM. *Auburn University- Delta Phi Epsilon and Sigma Sigma Sigma presenting. Sigma Sigma Sigma invited to colonize, Fall '16. *Samford University- Alpha Chi Omega, Delta Delta Delta, and Kappa Delta presenting. Delta Delta Delta invited to colonize, Fall '16. *Arkansas State University- Tau Kappa Epsilon invited to recolonize, Fall '16. *University of Arkansas- Alpha Gamma Delta and Delta Gamma presenting. Delta Gamma invited to colonize, Fall '16. Alpha Gamma Delta invited to colonize, Fall '18. *California State Polytechnic University-Pomona- Alpha Gamma Delta, Alpha Xi Delta, and Gamma Phi Beta presenting. Alpha Xi Delta invited to colonize, Fall '16. *California State University- Los Angeles- Alpha Sigma Alpha and Delta Phi Epsilon presenting. Delta Phi Epsilon invited to colonize, Fall '16. *San Diego State University- Kappa Alpha Theta invited to recolonize. *University of California-Davis- Alpha Delta Pi, Alpha Gamma Delta, and Phi Mu presenting. Alpha Delta Pi invited to colonize, Spring '17. Alpha Gamma Delta invited to colonize, Spring '19. *University of California-Merced - Delta Phi Epsilon, Delta Zeta, and Phi Mu presenting. Phi Mu invited to colonize, Spring '16. Delta Phi Epsilon invited to colonize, Spring '18. IFC Pi Lambda Phi invited to colonize, Spring '16. *University of San Francisco- Delta Delta Deltaand Delta Gamma presenting. Delta Delta Delta invited to colonize, Fall '16. *Colorado Mesa University- Gamma Phi Beta invited to colonize, Fall '16. *Colorado School of Mines- Chi Omega, Gamma Phi Beta, and Kappa Alpha Theta presenting. Kappa Alpha Theta invited to colonize, Fall '16. *Metropolitan State College of Denver- Alpha Sigma Alpha invited to colonize, Fall '16. *University of Delaware- Alpha Omicron Pi, Delta Delta Delta, and Pi Beta Phi presenting. Pi Beta Phi invited to colonize, Spring '16. Delta Delta Delta invited to colonize, TBD '18. *Florida Southern College- Delta Delta Delta, Delta Phi Epsilon, and Delta Zeta presenting. Delta Delta Delta invited to colonize, Fall '16. *Stetson University- Alpha Delta Pi, Gamma Phi Beta, and Kappa Alpha Theta presenting. Kappa Alpha Theta invited to recolonize, Fall '16. *Dalton State College- Alpha Sigma Tau and Zeta Tau Alpha presenting. Alpha Sigma Tau invited to colonize, Spring '16. *Georgia College & State University- Alpha Gamma Delta, Alpha Phi, Delta Gamma, and Gamma Phi Beta presenting. Delta Gamma invited to colonize, Spring '16. Alpha Gamma Delta invited to colonize, TBD. *Georgia Southern University- Chi Omega invited to recolonize, Fall '16. *Georgia Tech University- Chi Omega, Kappa Alpha Theta, and Kappa Delta presenting. Kappa Alpha Theta invited to colonize, Fall '16. NPHC- Kappa Alpha Psi invited to colonize, Fall '15. Omega Psi Phi invited to colonize, Spring '16. Alpha Kappa Alpha invited to colonize, Fall '16. Phi Beta Sigma invited to colonize, Spring '17. IFC- Stacked expansion planned: Lambda Chi Alpha, Fall '16; Pi Kappa Phi, Fall '17; Delta Sigma Phi, Fall '18; Pi Kappa Alpha, Fall '19; Theta Xi, Fall '20. The following groups are in talks to expand to SIU TBD- Theta Chi, Chi Phi, Delta Upsilon, Kappa Sigma, and Sigma Alpha Epsilon. *University of Northern Iowa- Alpha Sigma Alpha, Alpha Sigma Tau, and Sigma Sigma Sigma presenting. Alpha Sigma Tau invited to colonize, Fall '16. IFC- Pi Lambda Phi and Sigma Chi presenting. Pi Lambda Phi invited to colonize, Fall '16. *Centre College- Alpha Sigma Alpha, Kappa Delta, and Phi Mu presenting. Kappa Delta invited to colonize. *Louisiana Tech University- Delta Delta Delta, Kappa Kappa Gamma, and Zeta Tau Alpha presenting. Delta Delta Delta invited to colonize, Fall '16. Kappa Kappa Gamma invited to colonize, '19-'20 TBD. *University of Maine- Delta Delta Delta invited to recolonize, Spring '17. *Towson University- Delta Phi Epsilon invited to colonize, Spring '16. *University of Massachusetts-Amherst - Alpha Sigma Tau and Sigma Sigma Sigma presenting. Sigma Sigma Sigma invited to recolonize, Fall '16. *Winona State University- Alpha Sigma Tau invited to colonize, Fall '16. *University of Central Missouri- Alpha Sigma Tau, Delta Delta Delta, and Gamma Phi Beta presenting. Gamma Phi Beta invited to colonize, Fall '16. *Lindenwood University- Alpha Sigma Alpha, Alpha Sigma Tau, and Phi Sigma Sigma presenting. Phi Sigma Sigma invited to colonize. *Missouri State University- Alpha Gamma Delta, Alpha Omicron Pi, and Alpha Sigma Tau presenting. Alpha Omicron Pi invited to colonize, Fall '16. *Southeast Missouri State University- Alpha Omicron Pi, Alpha Phi, and Delta Zeta presenting. Alpha Phi invited to colonize, Fall '16. *University of New Hampshire- Phi Sigma Sigma invited to colonize, Fall '16. *Ramapo College - Alpha Sigma Alpha invited to colonize, Fall '16. *Rutgers University- Alpha Gamma Delta, Alpha Xi Delta, and Delta Zeta presenting. Alpha Gamma Delta invited to colonize, Spring '16. *Seton Hall University- Zeta Tau Alpha invited to colonize, Fall '16. *Hartwick College- Theta Phi Alpha presenting. Theta Phi Alpha invited to colonize, Spring '16. *New York University- Chi Omega, Delta Gamma, and Kappa Alpha Theta presenting. Delta Gamma invited to colonize, Spring '16. *Syracuse University- Alpha Chi Omega invited to recolonize, Fall '16. IFC Delta Upsilon invited to recolonize, Fall '16. *Union College- Alpha Chi Omega invited to colonize, Fall '16. *Campbell University- Alpha Delta Pi invited to colonize. *East Carolina University- Alpha Gamma Delta presenting. Alpha Gamma Delta invited to colonize, Fall '17. *Elon University- Beta Theta Pi and Theta Chi presenting. *North Dakota State University- Alpha Sigma Alpha and Delta Delta Delta presenting. Delta Delta Delta invited to colonize, Fall '16. *University of Akron- Delta Zeta and Theta Phi Alpha presenting. Delta Zeta invited to colonize, Fall '16. *Kent State University- Alpha Gamma Delta, Delta Phi Epsilon, and Sigma Delta Tau presenting. Sigma Delta Tau invited to colonize, Fall '16. *Kenyon College- Alpha Omicron Pi and Phi Sigma Sigma presenting. Local sorority, Zeta Alpha Pi, looking to affiliate. *Ohio State University- Alpha Delta Pi, Phi Mu, and Zeta Tau Alpha presenting. Zeta Tau Alpha invited to colonize, 2016. *Wittenberg University- Alpha Xi Delta, Delta Zeta, and Kappa Kappa Gamma presenting. Alpha Xi Delta invited to colonize, Spring '16. *University of Central Oklahoma- Alpha Omicron Pi and Sigma Sigma Sigma presenting. Sigma Sigma Sigma invited to recolonize, Fall '17. *Drexel University- Alpha Omicron Pi, Delta Gamma, and Sigma Delta Tau presenting. Delta Gamma invited to colonize. *Clemson University- Alpha Gamma Delta, Alpha Omicron Pi, and Pi Beta Phi presenting. Pi Beta Phi invited to recolonize, Fall '16. *University of South Carolina-Beaufort- Alpha Gamma Delta, Alpha Omicron Pi, and Phi Mu presenting. Phi Mu invited to colonize, Spring '16. Alpha Gamma Delta invited to colonize, '17-'18 TBD. *Belmont University- Gamma Phi Beta invited to colonize. *East Tennessee State University- Alpha Omicron Pi, Alpha Sigma Alpha, Delta Zeta, and Gamma Phi Beta presenting. Alpha Omicron Pi invited to recolonize, Fall '16. *Sewanee- the University of the South - local organization, Alpha Delta Theta, affiliating with NPC Alpha Delta Pi and Alpha Omicron Pi presenting. Alpha Delta Pi invited to colonize. *Texas A&M University - Alpha Omicron Pi presenting. Alpha Omicron Pi invited to colonize, Fall '16. *Texas A&M-Texarkana- Alpha Sigma Alpha invited to colonize, Spring '16. *University of Texas-San Antonio- Alpha Delta Pi invited to colonize, Spring '16. *College of William & Mary- Phi Mu invited to colonize, Fall '16. *University of Puget Sound- Alpha Gamma Delta, Delta Delta Delta, and Phi Mu presenting. Delta Delta Delta invited to recolonize, Spring '17. *University of Wisconsin-LaCrosse- Sigma Sigma Sigma presenting. Sigma Sigma Sigma invited to colonize, Fall '16. *University of Wisconsin-Stevens Point- Alpha Sigma Alpha presenting. Last edited by LaneSig; 06-13-2016 at 01:21 PM. Last edited by LaneSig; 04-28-2016 at 10:10 AM. Last edited by LaneSig; 05-02-2016 at 05:11 PM. Last edited by LaneSig; 10-27-2015 at 04:51 PM. Last edited by LaneSig; 04-13-2016 at 02:51 PM. Last edited by LaneSig; 05-18-2016 at 10:57 AM. Last edited by LaneSig; 05-17-2016 at 10:47 AM. LaneSig, you can add Carleton to Delta Phi Epsilon's list. Thanks for the new thread!! Thanks for the new list Lanesig! Alpha Phi has a colony at Yale this Fall. UC-SD is a Spring 16 colony. All the rest are Fall 15 colonies. Per our facebook page, DG has been invited to colonize at New York University in February 2016! Edited to add a couple chapters, which I'll keep doing as more announcements are made-if I messed anything else up please let me know! Last edited by clemsongirl; 05-19-2015 at 12:51 PM. Delta Phi Epsilon will also be colonizing at Young Harris College in 2016. They have established a fb page for the group and will recruit in spring 2016.